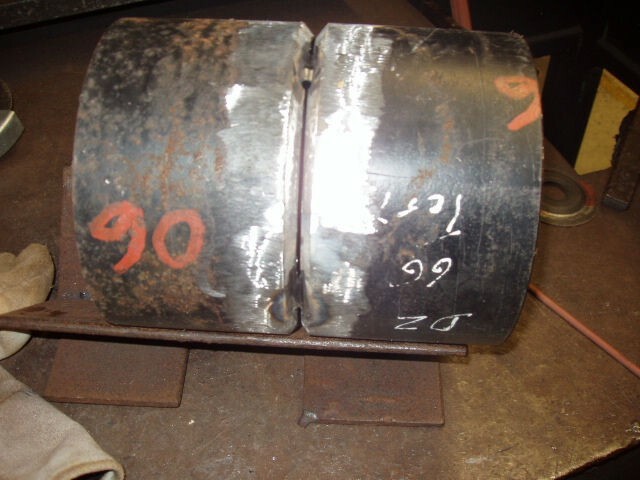 This page is about preparing weld test coupons for a 6G pipe welding certification. 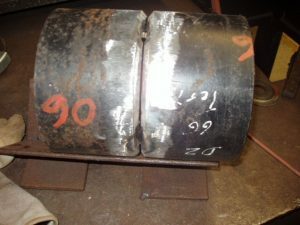 It’s a step by step guide starting with a single piece of pipe and ending with a ready to weld pipe test following the AWS B2.1 welding procedure code. The preparation of the pipe coupons was simple. The way I received the pipe coupon was a single piece of pipe. The first thing I did was cut it in half on a band saw and then beveled it on a pipe beveling machine. 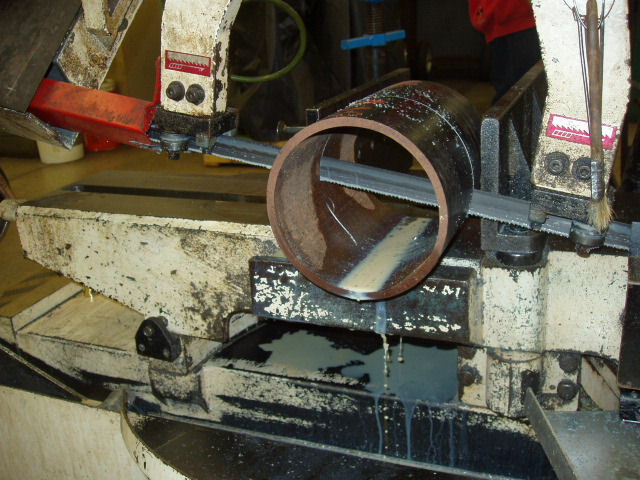 Splitting the single piece of pipe into two on the bandsaw. 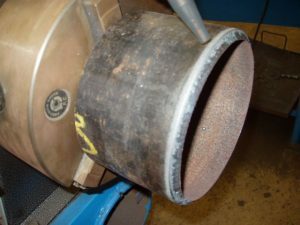 Once the pipe was split into two I beveled it on a oxy acetylene Watts pipe beveler. As a side note if you are fitting pipe in the field most people just use a grinder to get the bevel. Not as precise but that’s how it is done. Putting in the pipe into a Watts pipe beveler and aligning it to make sure it is cut straight. You need to spin the pipe and make sure the torch head runs evenly against the pipe. Firing up the oxy acetylene torch head and getting ready to preheat the pipe and burn off any debris. 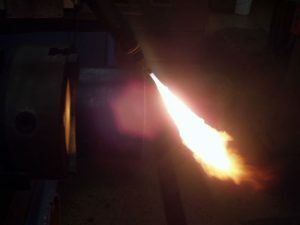 Preheating the pipe and burning off any mill scale or debris. At the same time making sure the torch head stays a even distance from the pipe throughout the rotation. 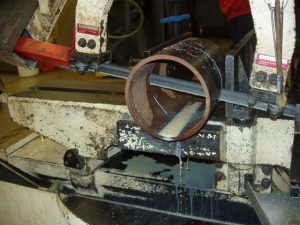 My next step was to grind off the oxidation from where the bevel was cut, followed by grinding the mill scale off of the outside of the pipe a minimum of one inch back, then the inside of the pipe about a quarter of an inch back. Mill scale ground a minimum of 1 inch back and the beveles oxidation is cleaned up. Checking the bevel angles with a protractor. The angle of the bevel was right where it needed to be. 30 degrees on each coupon or a total of 60 degrees for the weld joint just as the AWS B2.1 welding procedure requires. 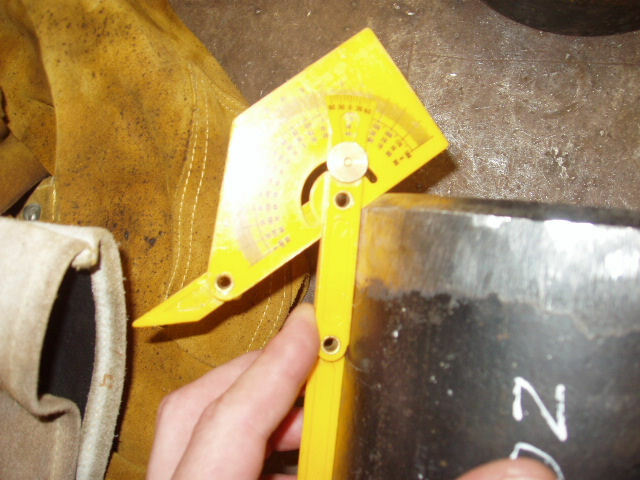 Checking angle of bevel with the protractor and it’s right on 30 degrees. I put my land on the bevel; I used about a 1/16th land. I used a grinder to make the landing and pretty much eyeballed it. After I was finished putting on the landing I took a 1/16th of an inch thick piece of scrap metal and used it to measure the landing. It’s a lot easier to use a electrode or piece of scrap metal to measure these then a tape measure that wear out and loose accuracy. On a side note after this test I typically used a 1/8″ land and gap for my E6010 open roots. Open root landing set at 1/16 of a inch. 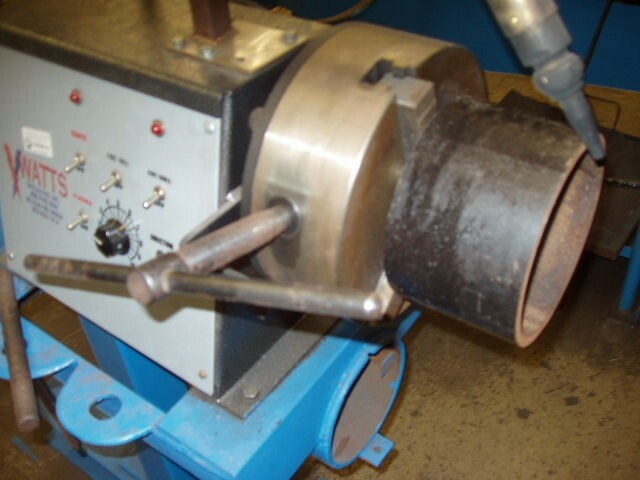 When setting up the welder for a 1/8 E6010 open root weld I used 90 amps for the tack welds. I did this because the pipe and electrode were not pre-heated enough and needed this amperage to penetrate properly. On the actual root I used 83 amps to weld it all the way out. The lower amperage was no problem because I piggy backed all of my tacks, while the electrode and the pipe had enough time to pre-heat. If the amperage was higher the keyhole would be too big. 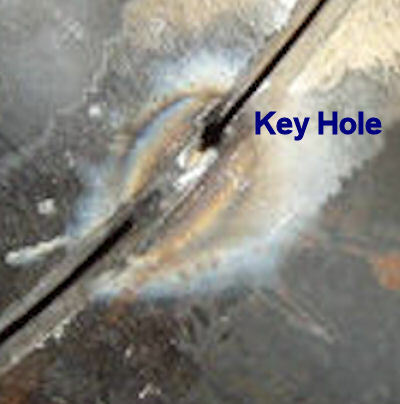 The keyhole you need to properly tack and weld a open root. 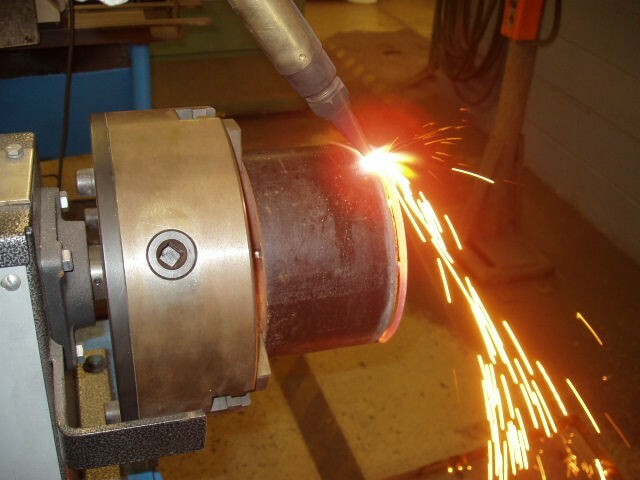 When setting a welding machine to do an open root weld you need to find amperage setting that is hot enough to open up a keyhole fast but not too hot that the keyhole gets too big! 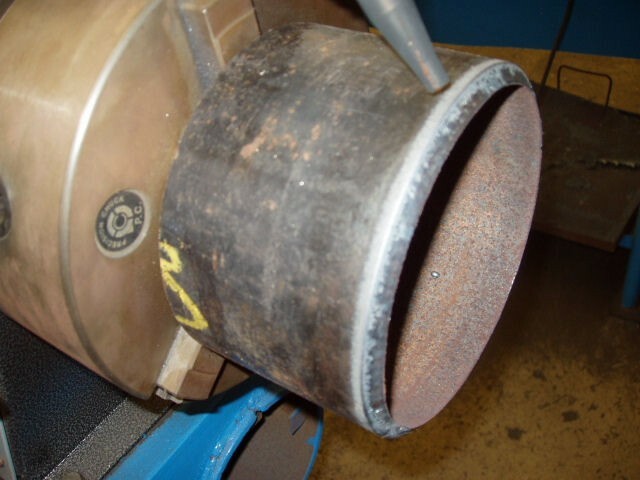 The main thing to look for when setting a welding machine to run an open root weld is for the amperage to be high enough that the electrode does not stick when testing it on a piece of scrap metal. The amperage setting should be high enough for it to barely weld without sticking. 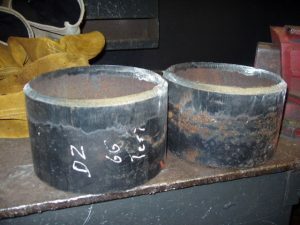 The set-up of the pipe coupons was done on a V Block. If that’s what the proper name of it is. Basically I used an angle iron to lay the pipe coupons on. It keeps the pipe coupons inline and makes it easier to tack. Then I took a 1/16 cutting wheel to set the root opening. The pipe in the V block and tacked together. Once the pipe was aligned properly I put in the first tack. Now once the tack cooled the pipe was out of alignment so I used a hammer to get the root opening even again. The tack welds will mainly shrink on the keyhole side of the tack. 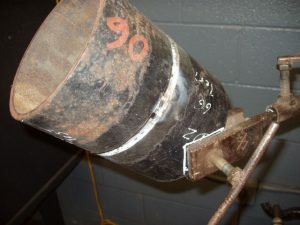 The next tack was done on the opposite side of the pipe. I had to tap the pipe a few times to get it to line up properly. I kept repeating this until I had four tacks. The first tack is in the 12 o’clock position, the second in the 6 o’clock position, the third in the 3 o’clock position and the fourth in the 9 o’clock position. All of the tacks were about 3/4 of an inch long. Finally I checked to root opening with the 1/16 cutting wheel and as usual the tack welds shrank. So I used the cutting wheel to open up the root opening. This is one of those tricks that not a lot of people will tell you about setting up open root welds. The cutting wheel will almost always make a perfectly even root opening! 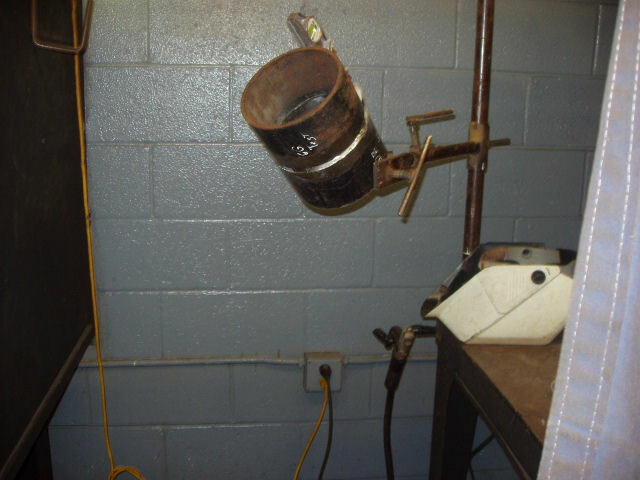 That is the main trick to passing any open root welding test! After I was happy with the tacks and root opening I feathered all of the tacks edged with the same cutting wheel. Once I got the pipe coupons tacked up, then I put them in the arm that holds the pipe in place. I took a level and set the pipe at 45 degrees. 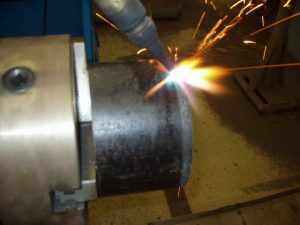 Next I set the height of the pipe to where I wanted to weld it. I prefer to weld the bottom half of the pipe on my knees and that also gives me a more stability then standing. Once everything was in place and I tightened the arm and called the welding instructor. Checking the 6G pipe test to make sure it is at a 45 degrees with a magnetic level. I set the height to what was the best position for me to weld from. 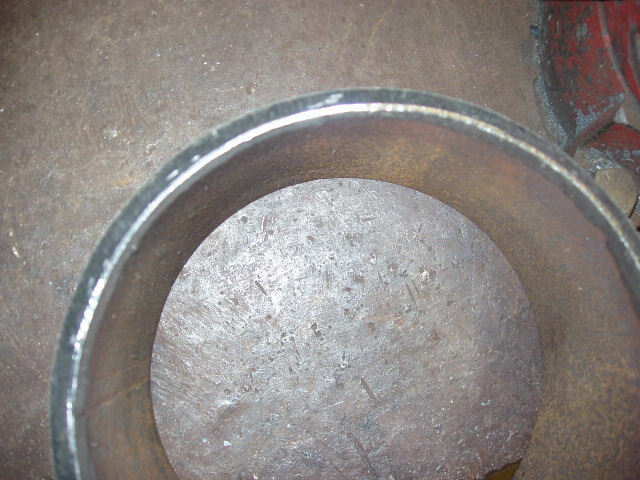 The Certified Welding Inspector rechecked the root opening and then marked a white line to make sure I do not change the position of the pipe during the test. “Now the test will be placed in the fixed position. 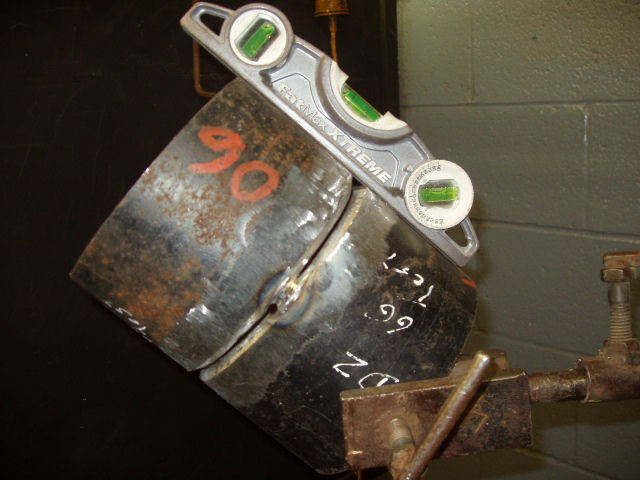 The test piece will be marked in position with a marker and the inspector may see the test anytime during the testing. (DURING THE TEST, THE PIECES SHALL NOT BE MOVED IN ANY DIRECTION AND OR REMOVED FROM THE TESTING PLACE WITHOUT THE INSPECTORS APPROVAL.)"